Lifelong medical management can improve quantity and quality of life in cats with this common respiratory disorder. Asthma, a common respiratory disorder in cats, is responsible for substantial morbidity and occasional mortality. Along with chronic bron­chitis and parasitic bron­chitis, it is one of the most important inflammatory lower-airway diseases of cats. Initial clinical signs of asthma first appear in young cats and typically include coughing (sometimes mistaken for “hacking up hairballs”), wheezing, and labored breathing. Without treatment, asthma can progress to more severe pathology. No cure is available, but life­long medical management can improve both quantity and quality of life. An understanding of the pathogenesis of asthma can help optimize treatment. Briefly, asthma in cats is believed to be allergic in etiology. Cats with the appro­priate genetic makeup and environmental influences mount a hypersensitivity response against what should be benign inhaled antigens such as Bermuda grass or house dust mite allergens. The aberrant immune response leads to elaboration of cytokines and allergen-specific immunoglobulin E (IgE) antibodies, which in turn attract additional inflammatory cells. One important goal of therapy is to limit or remove irritants and, when possible, specific allergens to which the cat is sensitized. A variety of inhaled irri­tants, including smoke (eg, cigarettes, wood-burning stoves or fireplaces, incense), dusts (eg, cat litter, carpet cleaning powders), and aerosols (eg, cleaning products, hair spray), may nonspecifically cause irritation and hyperresponsiveness of the airways, contributing to clinical signs. Additionally, specific allergens to which the cat has been sensitized, if identified, can help in designing an appropriate avoidance strategy. Although allergen-specific IgE can be identified via intradermal testing, the requirement to shave a large area of hair and the need for sedation make serum allergen-specific IgE testing more appealing. For example, cats that have high amounts of IgE against outdoor allergens can be kept indoors (with windows closed) during peak allergen periods. For cats that are sensitized to an indoor allergen, such as house dust mites, a variety of measures can be used: high-efficiency particulate air filters, frequent vacu­uming, washing bedding at least once weekly in the hottest water possible, and allergenic bedding covers for areas where the cat sleeps. The specific allergen to which the cat has been sensitized is responsible for triggering the cascade of airway inflammation and bronchospasm. Weight loss is often overlooked as a part of the management strategy for obese cats with respiratory disease. Obesity can increase the work of breathing and compromise respiratory function. It can also predispose to insulin resistance, which is highly relevant because lifelong glucocorticoids remain the mainstay of therapy. As mentioned below, dosing of steroids should always be based on lean body weight. Finally, although poorly understood in cats, obesity may have a negative effect on immune system func­tion. Cats with asthma should, ideally, have a body condition score of 4 to 5 out of 9. Without a doubt, bronchodilators represent the single most important treatment for a cat having a life-threating asthma attack (status asthmaticus). These drugs also may be appropriate for long-term management of cats with intermittent episodes of respiratory distress not well controlled by gluco­corticoids alone. 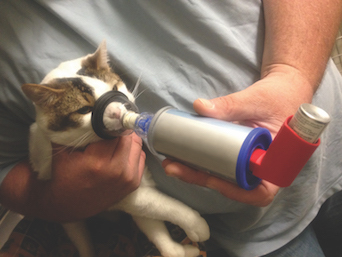 Bronchodilators are not critical as monotherapy for asthmatic cats with cough only. Commonly used bronchodilators fall into 2 classes—β2 agonists or methylxanthines—and can be adminis­tered by injection or inhalation or given orally. Short-acting β2 agonists such as terbutaline or albuterol are preferred over long-acting but less potent β2 agonists such as salmeterol. Methylxanthines include theoph­ylline and aminophylline. Selection of the optimal bronchodilator and route of administration should be guided by the patient’s needs. For cats in status asthmaticus presenting in crisis, I prefer injectable (intramuscular or subcuta­neous) terbutaline (0.01 mg/kg), because the onset of action is relatively rapid compared with other routes and the bronchodilator is delivered systemically. A second, less optimal choice would be nebulized or metered-dose inhaled albuterol. Although adminis­tered commonly in emergent situations, inhaled bron­chodilators do not reach their target of the lower airways effectively because of severe bronchospasm. If injectable bronchodilators are not available, using the strategy of dosing the inhalant bronchodilator, waiting a short time to allow partial bronchodilation, and then repeating the administration may allow the airways to open more fully and improve therapeutic efficacy. Although albuterol may be nebulized, it is administered most commonly via a spacer and tight-fitting face mask. Oral bronchodilators are not advocated for cats in status asthmaticus, both because of the prolonged onset of action and the stress associated with pilling a cat in respiratory distress. Once the life-threatening attack has been addressed, long-term management with a bronchodilator at home may be prudent. Regular (continual) use of the metered-dose inhalant racemic albuterol, an equal mixture of (R)- and (S)- isomers, paradoxically will cause airway inflammation in asthmatic cats; therefore, this medication should be used just as rescue medi­cation.2 The requirement to use racemic albuterol more than twice weekly merits reassessment of medical management of asthma and the need to use an alternative bronchodilator daily. The single (R)- isomer form of this product, levalbuterol, can be given regularly as needed to control clinical signs; it is the (S)- isomer that has been demonstrated to have the paradoxic detrimental effects. An oral bronchodilator (albuterol or theophylline) may be an acceptable alternative to inhalant bronchodilators for long-term management. Adverse effects of bronchodilators include hyper­excitability, systemic hypertension, and tachycardia. Thus, for cats well controlled on glucocorticoids—espe­cially if they have not previously had episodes of bronchospasm—bronchodilators are not a key compo­nent of therapy. The mainstay of treatment for allergic asthma is glucocorticoid therapy. Asthma is not curable, so lifelong therapy with glucocorticoids is needed to control ongoing inflammation, which contributes to both airway hyperresponsiveness and remodeling (permanent architectural changes). Because the clin­ical signs of asthma classically wax and wane, owners often assume that their cat does not need medication. Therefore, clients must be educated about the fact that asthma is chronic, progressive, and incurable but very medically manageable. The current recommendation is to taper the cat to as low a dose of glucocorticoids as possible to control clinical signs. Several formulations and routes of administration can be used for glucocorticoids. All should be dosed based on lean body weight. Injectable reposital formula­tions (eg, Depo-Medrol) should be avoided if any other option exists, because their efficacy decreases over time and the drug must be given more frequently. Short-acting injections of glucocorticoids (eg, dexametha­sone) can be given in tandem with bronchodilators in cats with status asthmaticus but are not recommended as owner-administered treatment. In stable asthmatics, I usually start treatment with oral prednisolone (not prednisone, which has lower bioavailability in cats) at a dose of 1 to 2 mg/kg/day. The dose should be tapered with periodic evaluation of clinical control. Inhaled steroids have the benefit of providing drug directly to the target (airways) with fewer systemic endocrine and immunologic effects than oral steroids. For young cats requiring lifelong steroids and cats with comorbid conditions (eg, cardiac disease, diabetes mellitus) in which oral steroids would be relatively contraindicated, inhaled steroids provide an excellent option. Their major drawback is expense. The delivery system (spacer with tight-fitting face mask) is the same as described for bronchodilators. Transdermal glucocorticoids have tremendous appeal for owners, and some compounding phar­macies will provide these; however, 1 study (as yet unpublished) showed the inability to detect predni­sone or prednisolone in the blood after 3 weeks of topical administration. Thus, transdermal steroids should not be recommended for asthmatic cats. There is growing interest in alternatives to the currently recommended therapies for feline asthma. Based predominantly on experimental models of feline allergic asthma, we know that several drugs are not effective and should not be given. Cysteinyl leukotriene inhibitors, used frequently in humans with respiratory allergies including asthma, do not work in cats. Cetirizine (and likely other antihistamines) is ineffective. It is unclear whether high doses of cyproheptadine as a serotonin antagonist would improve airflow, but studies have shown that this drug will not blunt airway eosinophilia.3,4 Maropitant, a neurokinin-1 receptor antagonist, cannot be used as an injection to treat cats with status asthmaticus and is similarly ineffective when administered long term. Nebulized N-acetylcysteine, a mucolytic with antioxidant properties, increases airway resistance and is considered dangerous for asthmatic cats. Treatments that show potential in experimental feline asthma that still require clinical trials in pet cats include cyclosporine, allergen-specific immunotherapy, small molecule inhibitors, and adipose-derived mesen­chymal stem cells. Additional research will provide answers as to the potential benefit of these therapies for spontaneous allergic asthma in pet cats. Dr. Reinero received her veterinary education and training from the University of California, Davis and Texas A&M University. She is currently a professor and director of the Comparative Internal Medicine Laboratory at the University of Missouri, Columbia. She has spoken internationally on respiratory diseases in small animals and has published about 100 peer-reviewed papers. Reinero CR, Delgado C, Spinka C, DeClue AE, Dhand R. Enantiomer-specific effects of albuterol on airway inflammation in healthy and asthmatic cats. Int Arch Allergy Immunol. 2009;150(1):43-50. doi: 10.1159/000210379. Reinero CR, Decile KC, Byerly JR, et al. Effects of drug treatment on inflammation and hyperreactivity of airways and on immune variables in cats with experimentally induced asthma. Am J Vet Res. 2005;66(7):1121-1127. Schooley EK, McGee Turner JB, Jiji RD, Spinka CM, Reinero CR. Effects of cyproheptadine and cetirizine on eosinophilic airway inflammation in cats with experimentally induced asthma. Am J Vet Res. 2007;68(11):1265-1271. doi: 10.2460/ajvr.68.11.1265.